Step 1: Start with the End in mind: Create the right question or starting point....what are you trying to achieve? Then create the environment where everyone can contribute fully, openly and creatively. We find anonymity really helps here: people feel truly free to say what they really think, contribute new ideas from a wider pool of perspectives. We find too many 'conventional brainstorm sessions' are restricted by people filtering what they feel able say out loud (by assuming what is acceptable) or they simply don't get the chance to contribute (others dominate the discussion). There will be a natural point in this step where everyone has had chance to capture their thoughts and perspectives. Then move onto the real collaborative step of sorting out the data! Step 2: Sort the 'Data': Discuss, theme, challenge and sort the ideas into sensible, pragmatic topics, themes or headings. Its clearer to see what your groups has when the 'data' is sorted. Its hugely important that the group conduct this exercise as they will become familiar with the 'data' as a whole and see where their ideas end up! Step 3: Make sense of the data: This is where you deep dive into the themed data and make sense of what has been captured. Continue to challenge assumptions, perspectives and perhaps bias and assumptions. By the way if this step takes twice as long as the previous two, then so be it, this is where the best ideas/solutions begin to form and reveal to the group. Step 4: Decision time: given you already know how you're going to decide which are the best ideas; take the synthesised ideas, apply the criteria (or criterion) and give everyone the independent and anonymous ability to select their top ideas. Rank them, prioritise them, select them; however you decide to reveal the best. Then you need a further pragmatic, open discussion on the impact of the prioritisation; does it make sense? are there any ideas/solutions being left behind that warrant keeping? Is the team truly bought into the decision with passion and commitment?? Only then should you move to step 5. Step 5: So What's the Plan? This is where you develop the plan or next steps to ensure your decision is implemented; You're already half way there because your people have contributed and committed to the entire decision making process so implementing the outcomes will be relatively straight forward. This step requires the team to build the todo list....what needs to be done, who should do it, by when and how. 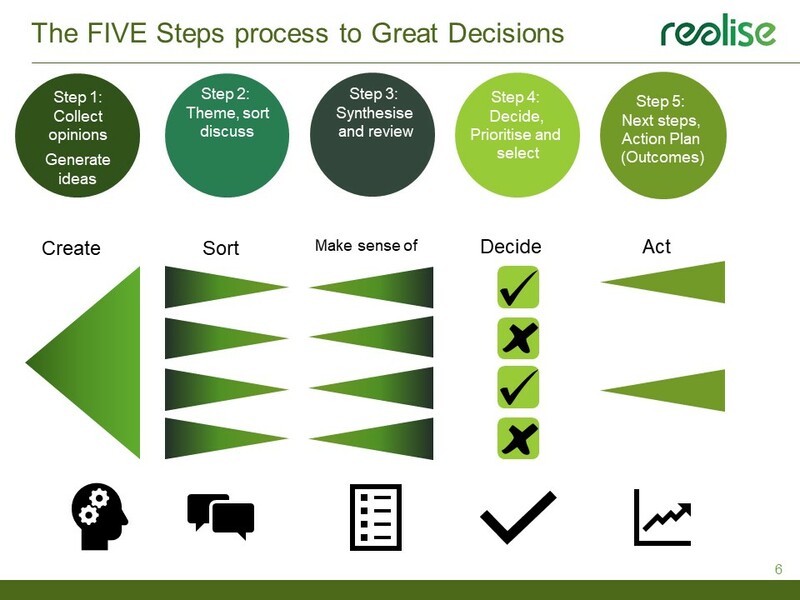 We know this is a simplification of often complex decision making processes; if this is a new Strategy implementation then the decision making process will involve dozens if not hundreds of stakeholders; you may not need to include everyone in all five steps but you will need to diligently complete all five steps to ensure the decision is the right one and willingly implemented by enthusiastic supporters.